Mr. Ramamoorthy Ramasamy, owner of Madras groceries and Madras caf� of Sunnyvale, has been a staunch supporter of Udavum Karangal Bay Area Chapter since 2007. Along with being a successful business owner, he holds a job at a high tech company and also finds time to contribute to various charity organizations. 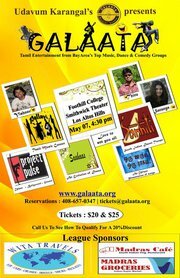 For the second year in a row the Madras Group is the sponsor for Galaata Idol at Galaata�09, the annual fund raiser of the Udavum Karangal Bay Area Chapter. Here, Mr. Ramasamy shares with us the reason behind his continued support for Galaata, even in such trying times and the secret of his success.